Tongan, Samoan: 'olive (Olea europea). When people arrive in places quite new to them, they look for reminders of home in a strange environment. Where plants are concerned, this has often led to old names being applied to plants that are new in more ways than one – they remind people of the old ones, but may have little in common with those from a botanical point of view. This is true of the trees named “maire” by the Polynesian explorers and settlers in New Zealand and the Pacific, and of the trees labelled as “olives” by English-speaking explorers and settlers who arrived here several centuries later. And since some of the same plants that reminded the Polynesians of the “maile” also reminded the Europeans of “olives”, it’s not surprising that there’s quite a lot of overlap, and confusion, in the use of these labels. This fusion and confusion is reflected also in the botanical names of some of these plants, as well as common usage in English, where olives are concerned, and Polynesian languages, about what is and is not a kind of maire. When the research group of the Waikato branch of the NZ Tree Crops Association become very interested a few years ago in our local “maire” and some exotic varieties of “olives”, I thought it would be a good idea to try to write a little guide to the names and the plants they refer to; perhaps that way we might have a better chance of determining what plant or plants we are talking about! This article is a revised and expanded version of one that appeared in the NZTCA Waikato Branch Newsletter, June 2006, pp. 11-16. Firstly, the “true” olives – the ones you expect to be the source of the olive oil you cook with, or the jar of olives you buy in the supermarket, are cultivated varieties of the species Olea europea, used throughout the Middle East and Mediterranean for millennia, and brought to New Zealand in the nineteenth century. It has a few close relatives here – the black, white, coastal and mountain maire, which originally were grouped in the same genus as their European cousin, but which the botanists now group together under the genus Nestegis, which also includes a Hawaiian species, the olopua, N. sandwiciensis, known in English (perhaps predictably) as the “Hawaiian olive” (and which, just to complicate matters, also used to go under a different generic name, Osmanthus). The other “olives” belong to quite different plant families – more about those later. Next, the “maire”. One could say that the “true” maire are the fragrant shrubs of the genus Alyxia, the best known of which include the Hawaiian maile, A. oliviformis , and the Cook Island maire, A. stellata, much used for making leis for honouring distinguished people. As you can see from the scientific name of the Hawaiian variety, there is something “olive-like” about the plant which struck the botanists as important enough to be noted – the small fruit is indeed highly reminiscent of an olive, and the leaves are vaguely olive-like too. 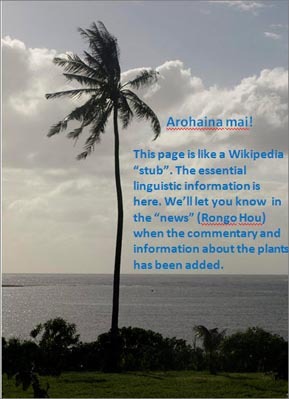 It’s not surprising, then, that the Polynesian explorers latched on to these features when naming some of the new plants they encountered in this country in a way that coincided with the perceptions of European visitors familiar with the olive. These maire do have a relative in Aotearoa, the two species of Parsonia vines, but, despite their being very attractive plants with conspicuous sprays of white or red flowers, the relationship was more apparent to botanists than explorers, so those plants were named kaihua (P. heterophylla) and kaiwhiria (P. capsularis) respectively. Instead, the plant that seemed most like the tropical maire in appearance and fragrance was the maire hau, Phebalium nudum. 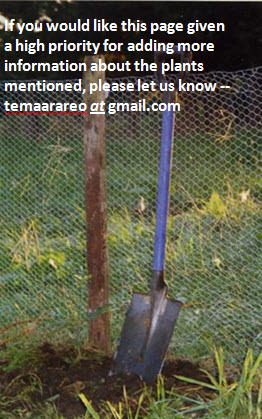 This was an important cropping shrub to the Māori for its fragrant leaves and flowers. It grows naturally from Northland to the Waikato and Coromandel. The leaves are dotted with oil glands which contain the essential oil of citronella, along with phenol and camphene; the flowers also are sources of aromatic oils. The leaves were used in sachets (a more modern use is as a flavouring for mulled wine), and the concentrated oil was added to a certain kind of shark oil for annointing chiefs on special occasions, mixed with pigeon fat as a sweet-smelling hair dressing, and also used to scent tītoki oil. By itself, maire hau oil can set up an alergic reaction in some people if their skin is exposed to sunlight, but diluting it in another medium presumably minimizes this risk. I noticed an advertisement from an aromatherapist offering the oil for $15 a bottle – I assume that the essential oil is mixed with a carrier oil for this purpose. The foliage is also extremely attractive to goats, although I think it would be wasting a valuable plant to use it deliberately as goat-fodder. This brings us straight to the “Chinese olives”, which, as you can see from the chart below, are more closely related to the maire hau than they are to the “real” ones. We may be hearing more about these olive-like fruit some time in the future, as the possibility of bringing plants of Canarium album (the white Chinese olive), C. tramdenum (black Chinese olive), and perhaps C. odontophyllum (dabai, a fruit with avocado-like qualities) is explored further by the Tree Crops Association research group. They are tropical trees and we don’t yet know whether they can be grown successfully in New Zealand. However, those who have sampled them say that they taste and are used very much like the European olives. The close relatives of the European olive in our flora are the four species of Nestegis. One of these, N. cunninghamii, the black maire (maire rau nui, also known as pau) is a very large canopy tree (up to 20m. high and with a straight trunk well over a metre in diameter) found throughout the North Island, although much less common than it once was because for decades it was a principal source of high-quality firewood. It has a very tough, clean-burning wood. The narrow, leathery leaves look a bit like stretched laurel leaves; they’re up to 25 cm long in the juvenile stage, and about half that in the adult form. They fruit look a bit like koroneiki olives and are about the same size – oval, broader at the stalk than the tip, and borne on little branchlets. The tree flowers in Spring, and the fruit takes about a year to ripen. The flowers are bisexual, and the ripe fruits are brightly coloured, orangey-red or yellow. N. apetalata, the coastal maire, is native to the Bay of Islands and Whangarei. Its fruit are similar to those of the black Maire, but smaller, and taper more acutely. It has glossy, leathery leaves broader than those of the black Maire, but it is a much smaller tree, reaching only about 6m. The flowers may be either bisexual or unisexual. N. lanceolata, the white maire, grows almost as large as N. cunninghamii and has a similar range. Sometimes the trees have only male or female flowers. The fruit is reddish when ripe and more attenuated than with the black maire (although blunt at the tip) and slightly ribbed. The fourth species of Nestegis, N. montana (oro-oro, maire kōtae or maire rōroro) is also found throughout the North Island and the north of the South Island. It has a much shorter and slimmer trunk than the white and black maire, but it grows to 15m nonetheless, with an extensive multi-branched canopy. Its fruit is shorter and narrower than the other maire (less than 1cm long) and its narrow leaves seem to come straight from the branches as the leaf stalks are only a millimetre or two long. Yet another maire is the maire taiki (usually just called “maire” in English), Mida salicifolia. Its leaves are reminiscent of the white maire (although in Northland they tend to be much wider than the very narrow and attenuated leaves of trees growing naturally further south), but the species is in quite a different botanical grouping from Nestigis and Olea. It grows to about 6m and has a thin trunk, about 20 cm in diameter when fully grown. Like some of its namesakes, it has narrow, bright-red fruit about 12mm long that take about a year to mature. And, reminiscent of the original maire, it has clusters of showy white fragrant flowers. In Māori tradition, it was a sacred tree, and special ceremonies were required before it could be felled. This was probably a conservation measure, as its firewood was greatly valued; it gives off a great deal of light and heat, which is just what you need in a house with neither chimney or electricity, and being relatively easy to fell it could soon have been a candidate for extinction. The last of the maire is the maire tawake or swamp maire, also known as whāwhākou and tuhuhi. It is now known scientifically as Syzygium maire (in older books it will be called Eugenia maire). This is a very important tree, excellent for firewood and protecting riverbanks, and the berries were used by Māori and early European settlers to make a delicious dessert. The young twigs and bark can also be steeped in water to make a blue-black dye for flax. The tree has many relatives in Asia, the Pacific and America which have medicinal properties, and, among other things, the Māori used a decoction of the inner bark for treating ringworm. More recently, it has been discovered that the berries of maire tawake have a level of antioxidants 18 times greater than blueberries, which are the standard point of comparison for antioxidant-rich fruit. This obviously is a tree with a great future. Left to itself, it will grow about 15m high, with a spreading canopy. Its leaves are reminiscent of maire hau, less attenuated than black maire (8-10mm long) and with prominent blisters. It bears fruit, bright red when ripe, in clusters with one fruit to a stalk and one seed per fruit. The fruit look a bit like mini-persimmons about 12 mm in diameter, and, as with most of its namesakes, they take about a year to ripen. The tree grows naturally in swampy forests throughout the North Island and northern South Island, and actually needs the water to flourish. It can stand wet feet and even a wet base, but it usually dies if the swamp in which it’s growing is drained. HĪNAU - "NEW ZEALAND OLIVE"
That brings us to the end of the maire. There’s one more “olive” to add to the list – the hīnau, Elaeocarpus dentatus, which is in a completely different subclass of the plant kingdom from all the others. It has been called the “New Zealand olive”, because of the shape of its fruit. And the botanists alsonoticed something olive-like about this group of plants, although thy classified it in a completely different section of the plant kingdom from all the rest of the maire and olives we have been looking at. The order, genus and family names are all derived from the Greek word for "olive". We don’t need to say anything more about the hīnau here, however, as there’s a page devoted to it on this website (click on the link to get there). The terminology is summed up in the table below. If you compare it with the table of "scientific" classifications near the beginning of this article, you can see how the relationships between plants are multidimensional, and even the botanists in their descriptive terminology reflect qualities other than those they use for determining scientific relationships. The salient feature for the European classification of "olive" has probably been the appearance and potential use of the fruit, and whether or not the plant is a tree; the botanists have concentrated on the structure of the reproductive organs and, more recently, the DNA for their classification, but have also looked at the form of both the fruit and the plant as a whole when allocating names to individual species, while for the Polynesians the richly scented flowers and foliage, along with the appearance of the fruit have clearly been salient factors in determining what is a "maire" (a little more is said about this on the page for Proto Polynesian *Maile). For some plants, these views have converged, for others they have led in quite different directions. K. Gould, et al., “Antioxidants in Maori food plants. 1.” New Zealand Journal of Botany Vol. 43, No 1, 2006. L.J. Metcalf, The Cultivation of New Zealand Trees and Shrubs (Wellington: Reed, 1972). John Dawson and Rob Lucas, New Zealand's Native Trees (Nelson, Craig Potton Publishing, 2011). The “Crescent Bloom” website has an excellent set of links to databases about plant relationships.